American artist Chrys Kozak is an avid foodie, traveller and self-proclaimed espresso addict. You'll find cups of cappuccino and coffee hidden somewhere in all of her jigsaws puzzles! 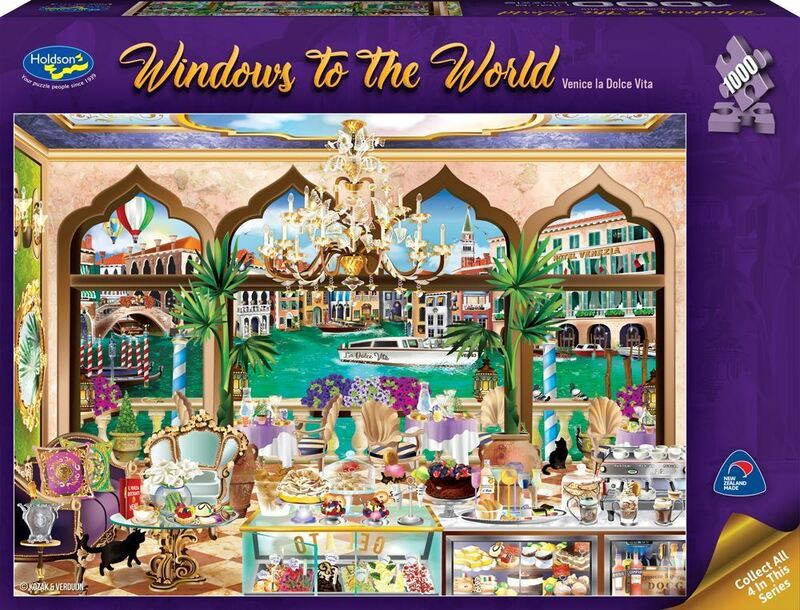 Always wanting to draw a puzzle series that incorporates all of her favourite things (food, travel and culture) Windows to the World was born! These puzzles let you visit cities you may have only dreamed about and view them from inside a store or cafe and you feel like you're really there! Look at the architecture, see the city's famous monuments, you can almost smell the food and flowers and hear the sounds coming off the street. There are hundreds of authentic details true to each city that you'll discover in all of the Windiws to the World puzzles. Titles include: Amsterdam Flower Market, Bonjour Paris, London Tea Party and Venice la Dolce Vita. Each title sold separately. Collect all four titles. Age 8+ years. Made in New Zealand by Holdson. Approximate puzzle dimensions: 688mm x 493mm. Box size: 270mm x 370mm.